ABC is bringing family comedy back to Friday nights, and they’re starting with the new Reba comedy series MALIBU COUNTRY. ABC’s take: “When Reba Gallagher (Reba) discovers that her husband, Bobby, (Jeffrey Nordling) a country music legend, has a cheatin’ heart, her world is turned upside down. Reba dreamt of becoming a country star herself, but put her career on hold to raise a family. Now she’s questioning all of that, big-time. With the ink on her divorce barely dry, Reba packs up her sharp-tongued mother, Lillie May (Lily Tomlin), her two kids and the U-Haul and heads for sunny California to begin a new chapter. Leaving Nashville in the rear view, they start over at their Malibu residence — the last remaining asset they have. 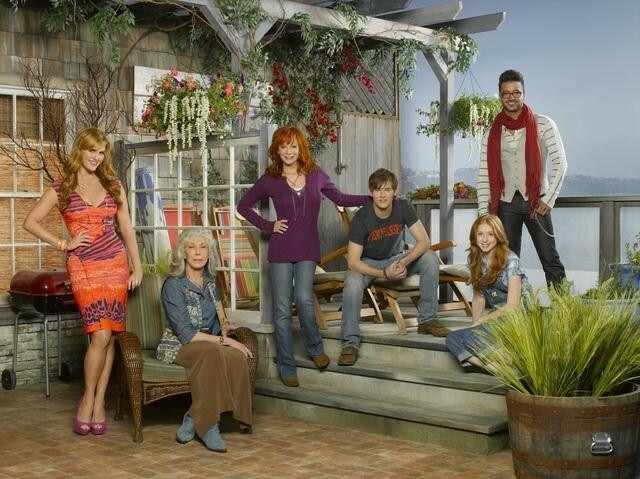 Reba gets to know her new open and loving neighbor Kim (Sara Rue) and her son, Sage, but also discovers that relocation to Southern California is going to be quite an adjustment for a traditional southern belle: the West Coast seems like the polar opposite of Music City, and Reba feels like an outsider. Still, with the support of her family she sets about finding her voice, jump-starting her music career with the help of her new music agent, Geoffrey (Jai Rodriguez), and embracing this chance to begin again. It’s very “Reba” isn’t it!? It is totally “Reba” – but I loved Reba so I thought it looked cute. But not sure the same show will fly twice.